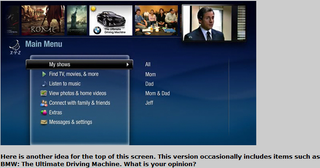 TiVo is apparently focus testing a new, more modern user interface that puts content—and ads—front and center. Besides finally adding Picture-in-Guide so you can keep watching a show while chugging through the guide, the main menu is now lined with a row of pictures along the top. The thumbnails are a combo of recently watched, favorites and suggestions—as well as ads. More details, and videos of the new UI in action are below, courtesy of Dave Zatz.